Fire companies throughout Delaware hand out FREE smoke detectors and replacement batteries to residents, when available, as part of the continuing fire safety initiative known as Wake up Delaware. All 86 fire stations statewide participate in providing battery-operated smoke detectors, replacement 9-volt batteries and fire prevention information to residents who visit the firehouses. 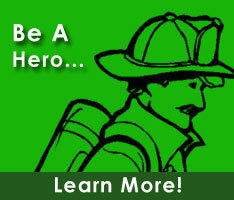 Residents are encouraged to visit their local firehouse to receive the free detectors and batteries, when available, and are asked to provide address information to assist fire department personnel in their continuing effort to ensure that every household in Delaware has at least one working smoke detector in place. Brochures describing recommended installation practices are also available in English and Spanish. Persons requiring assistance with installation or replacement are encouraged to ask their fire company for help. Despite documented "saves" resulting directly from this initiative, it is still estimated that many of the homes in Delaware are not equipped with working smoke detectors. The Wake Up Delaware program was conceived in 2001 by members of the fire service, as the direct result of the tragic deaths of 16 Delawareans in two residential fires, five (5) deaths in Broadkill in October 2000 and eleven (11) deaths in Indian River in January 2001, where there were no working smoke detectors in place. Wake Up Delaware has been recognized as the only initiative of its kind in the United States, where all fire stations in a state join together at the same time on a given day to distribute free smoke detectors and batteries to residents. Nearly 100,000 detectors and 50,000 batteries have been made available to residents?all free of charge?as a result of this program. Wake Up Delaware is funded by a federal grant, as part of the Assistance to Firefighters ("Fire Act") grant program, sponsored by FEMA and the U.S. Fire Administration. Additional information is available by contacting the Delaware Volunteer Firefighter's Association office in Dover, toll-free at 877-455-3832 or Paul Eichler, Program Coordinator, at 302-302-359-3057 (cell) or 302-734-2992, Todd Riley 302-542-7621 or Jeff Dennison 302-632-8540.